Spilling coffee on the carpet doesn't have to mean the hassle of a patch job or the expense of a new floor covering. You can remove the stain using items from your pantry. For best results, though, you've got to act fast. It’s not what you feared. Spilling coffee on the carpet doesn’t have to mean living with an eyesore until you replace the floor covering. 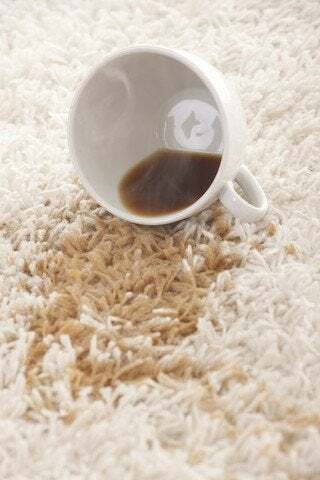 Besides the branded cleaners readily available in stores, you can remove coffee stains from carpet using a combination of only a few common household items you likely have on hand already. Time is of the essence—the faster you treat the stain, the better your chances of restoring the carpet to pristine condition. As soon as you discover the accident, jump into action by moistening, not soaking, a clean cotton cloth. Next, use the cloth to blot around the sides of the stain, gradually working toward the center. Do not press down hard on any portion of the affected area. Rather, continue blotting, dampening fresh sections of the cloth as needed, until the stain becomes faint. If blotting alone isn’t doing the trick, follow the steps outlined below to remove coffee stains from carpet, whether the mark has been there five minutes or five days. Mix one tablespoon of liquid dishwasher detergent with one tablespoon vinegar and two cups of water. While the detergent works to dissolve the stain, the vinegar dislodges the coffee from the carpet fibers. Dampen a clean cotton cloth in the solution, then apply it to the stain with frequent blotting. First, blot the perimeter of the mark, then work gradually towards the center, re-moistening the cloth as you go along. To absorb the detergent and vinegar, sponge the affected area with cold water, then blot it dry with paper towels. Before finishing up, consider going over the once-stained carpet with a hair dryer or hand vacuum. In the grand scheme of cleaning solutions, homemade or store-bought, liquid detergent and vinegar are quite mild. Even so, before applying the mixture to your carpet, it may be wise to test it somewhere inconspicuous. In the case of wall-to-wall carpeting, experiment on the floor of a seldom-used closet. Otherwise, focus on the carpeting located beneath a large piece of furniture. When testing, be sure to wait a few minutes before assessing the results. If the mixture seems to have hurt rather than helped, try to remove it right away with cold water and a sponge. Even if the attempt fails miserably, you will have jeopardized only a small patch of carpet in an out-of-the-way place, while learning to look for a new strategy. Of course, the right approach to cleaning a coffee-stained carpet can return the textile to its unblemished state, so long as you are prepared to be patient and persistent in your efforts.